Halo Wars 2 is not the RTS genre's salvation. I briefly wrote about Halo Wars 2 last week—mostly performance and issues I had with the PC controls at launch. 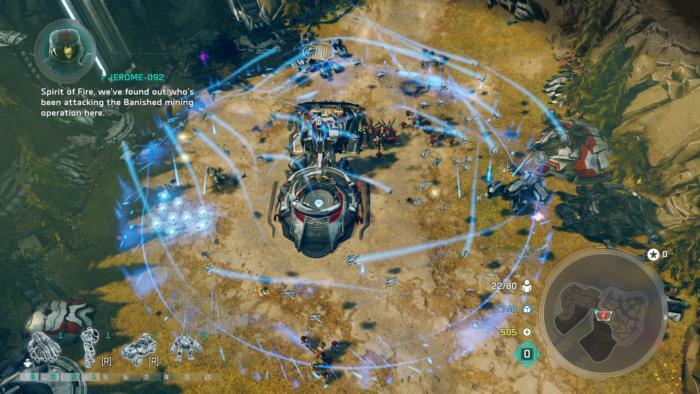 Rather than rehashing those quibbles, head over here for PCWorld’s look at the technical side of Halo Wars 2. This will be our official review of the actual game, focused primarily on the campaign and the “should-be-good-except” Blitz Mode, both of which I put more time over the past week. The short version? Halo Wars 2 isn’t bad, but it’s definitely not the real-time strategy genre’s long-sought salvation. Halo Wars 2 is actually a perfect case study for someone who’s curious about what happened to RTS games. Oh sure, we still get the occasional entry—the three separate pieces of StarCraft II, of course. Grey Goo, for another. But by-and-large the genre’s faded in popularity commensurate with the rise of MOBAs like League of Legends, and it’s understandable for diehard fans to wonder why. Why did the once-dominant strategy genre die off? The answer: They’re all the same damn game. I actually broached this question in one of our previews, asking how 343 Industries and Creative Assembly planned to sidestep this issue and make the Halo Wars 2 campaign interesting. I was promised surprises, twists on old design ideas. Mission 1) Guide a squad of soldiers through a battlefield without them all dying. Mission 2) Lead troops through a canyon, then build a rudimentary base for a big confrontation. Mission 3) Guide a squad of soldiers, then build a base and capture three points. And so on and so forth. There’s a 30-minute holdout/tower defense mission. There’s a wave-based holdout mission. There’s “That Mission Designed To Use That One Unit That’s Mostly Impractical But Works As A Gimmick.” Halo Wars 2 checks all the boxes you’d expect from an RTS game. There are a few standout moments in among the game’s twelve missions. One, involving a group of snipers creeping through enemy territory, hearkens back to the original Halo’s infamous “Truth and Reconciliation” level. Credit to animation powerhouse Blur, too—many missions are bookended by gorgeous CGI cutscenes. The writing’s a bit thin, the baddie’s motivations amounting to basically “I’m evil because I’m evil,” but hell, I’d still take a Halo movie in this style. RTS design is so stagnant, though. Those scenes accurately capture the feel of the Halo universe, this galaxy-spanning space opera—and then you jump to the in-engine scenes and it’s stilted, low-poly character models awkwardly running around, shooting guns that don’t really have any heft to them, and all in service of the same missions you’ve played a dozen times over. The problem as I see it is that this is Halo. It’s not some independent developer purposefully hearkening back to ‘90s design ideas, nor is it a smaller studio constrained by tight budget worries. 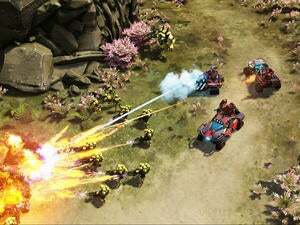 Halo Wars 2 has the name cachet and the backing to really experiment, to try and evolve the RTS. With all that going for them, 343 and Creative Assembly either didn’t or—more worrisome—couldn’t. So no, the Halo Wars 2 campaign isn’t especially bad. 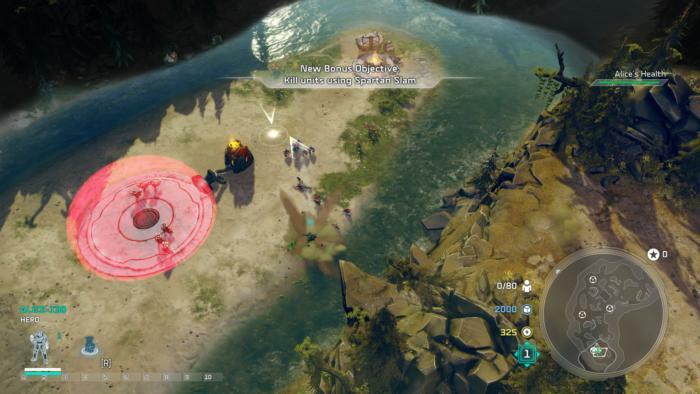 Many missions can be brute-forced by ball-of-deathing your units into one big group and steamrolling the opposition, and it’s certainly a bit simplified due to its console origins. It works, though. It’s fine. What rankles me is that “fine” in the RTS genre is really synonymous with “more of the same.” In the case of Halo Wars 2 it’s “More of the same, but with a Halo skin.” If that piques your interest, great. If not, well, I don’t blame you. Worse is that the game’s Blitz Mode is a legitimately great idea, sandbagged by one hell of a predatory business model. Bad pay-to-win ideas are apparently this month’s theme, with fellow February release For Honor also having more than its fair share of gross microtransactions. Halo Wars 2 saddens me more though because Blitz Mode, detached from the nickle-and-dime contraption, is a great idea. 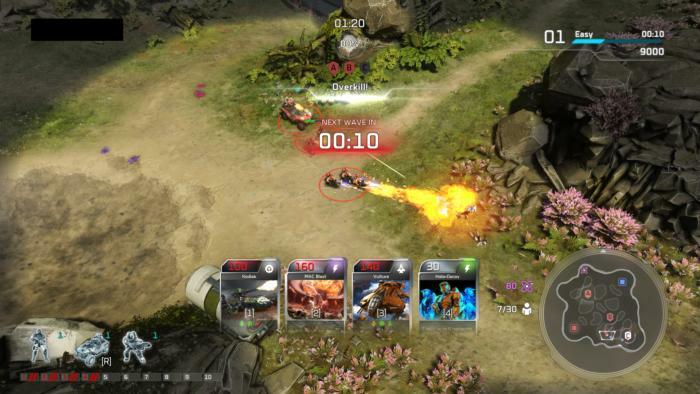 As it was described to me in our earlier preview: Imagine Blitz Mode as the RTS genre taking ideas from MOBAs. It’s RTS multiplayer, but without all the slow build-up period and the feinting and the sounding out your opponent. Instead, Blitz Mode cuts right to the good part, the point where it all kicks off and two armies meet and start battering each other. Units are contained in a deck of cards, with each unit costing a certain amount of power to field. They’re then warped immediately onto the battlefield, meaning you can turn things around mid-conflict by sitting tight, gathering resources, and then warping (for instance) a tank into the fray. Or you can field dozens of small units, overwhelming the enemy in numbers. Sure, there’s a certain amount of luck involved so Blitz Mode may not have as high a skill-ceiling as a true RTS, nor is it likely to appeal to the people who enjoy the stuff I mentioned above—base-building, feinting, scouting, et cetera. But for people who don’t enjoy that part, or who don’t want to commit to a 40-minute, full-fledged RTS match, Blitz Mode is great. The microtransactions, though. Like every other card-based game I can think of, Halo Wars 2 lets players buy card packs, for about a dollar per pack. The highest-priced package is technically the “best deal,” netting you 135 packs for the low, low cost of a hundred freaking dollars. 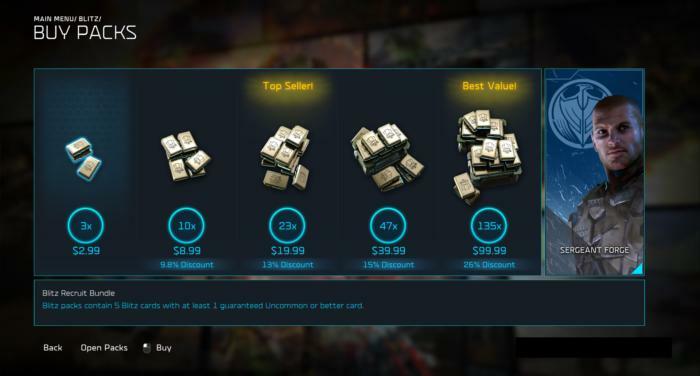 Packs are also earned for playing, sure, but the point is that it’s easy (and encouraged) for players to buy their way up to the best units. Am I surprised the game took this route? Nah. It’s money on the table otherwise. But I can still object to it, and object I do. I really enjoy Blitz Mode, but in such a tactical game, with so much reliant on deck construction, I find myself turned away at the idea of facing people who aren’t necessarily better, but have just spent more—especially with Blitz-centric DLC in the pipeline. 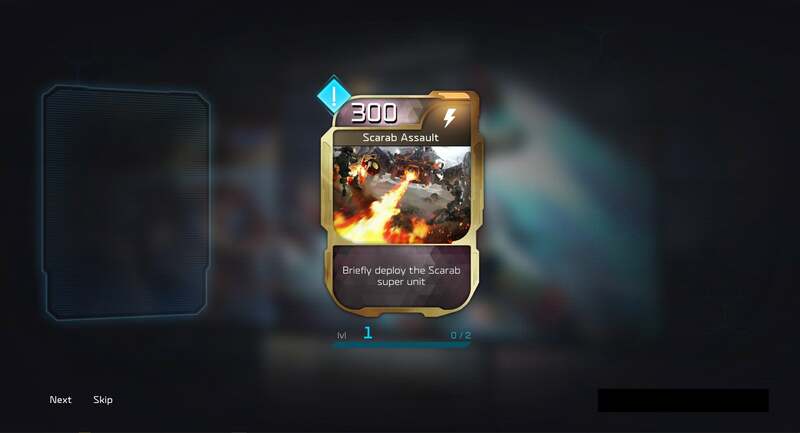 The one saving grace in this is that you can play Blitz Mode co-op, a la Halo’s Firefight—itself a reskin of Gears of War's Horde Mode. This takes away the deck advantage, making it more about wave-based survival. In my opinion this is the best offering in Halo Wars 2, and the one I’ve found most engaging, trying to beat my own score on the ladder. It’s also the one, coincidentally, with the most longevity. Halo Wars 2 is an Xbox Play Anywhere title, meaning if you own it for Windows 10 you also own the Xbox One version. There’s no cross-play though, presumably because a mouse-and-keyboard user would kick the teeth out of a gamepad user in a multiplayer RTS. I imagine the Windows 10 version isn’t going to sell nearly as well though, which means multiplayer might be dead within a matter of months. Maybe a year? I’m no prophet, but I’ve seen the way these things typically go and it’s not pretty. Something to keep in mind. 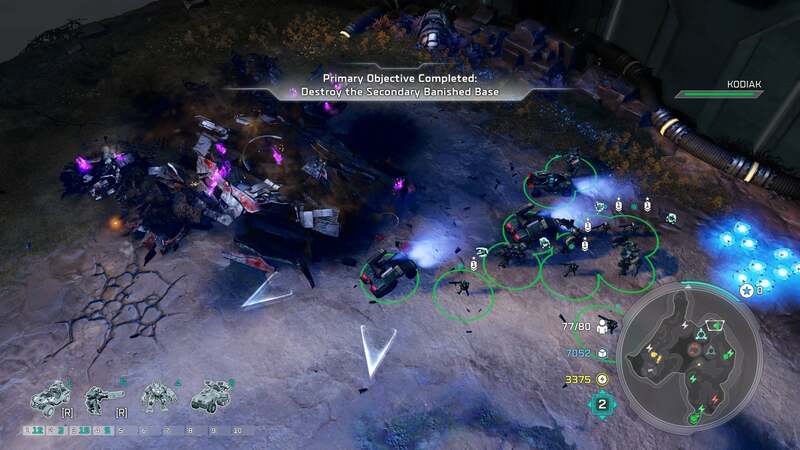 And remember, beyond those gameplay gripes, there's also a host of performance issues and control scheme issues, which (again) you can find in PCWorld's Halo Wars 2 review-in-progress from last week. Suffice it to say: The game doesn’t quite nail everything you’d expect from a PC RTS, though it does a decent-enough job I’m not too frustrated. Halo Wars 2 is just a perfectly average release in a genre suffused with perfectly average releases nowadays. I think every RTS fan is waiting for “That Game,” the one that’ll turn it all around and make us RTS believers again. I know I’m waiting for that moment. Halo Wars 2 isn’t it. It’s competent, it’s shiny, and it’s got the Halo universe to draw people in, but there’s nothing so “Oh wow it’s brilliant!” about this package to really get excited. The one aspect that should do that is Blitz Mode, and it’s hampered by the small PC multiplayer population and the nakedness of its Pay-To-Win-esque systems. On consoles, where the RTS genre is woefully underrepresented, I expect people will be a bit more impressed by Halo Wars 2. But on PC, it’s just another sign of a fading king. Halo Wars 2 is fine, but definitely not the real-time strategy genre’s long-sought salvation. Same-old missions, same-old structure, and with a layer of console-style oversimplification on top.